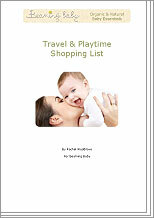 Our Baby Care Experts have created this list of everything you need to Play with your baby and take her out and about. The one essential piece of travel equipment you will need is a rear-facing car seat to take your baby home from hospital. It's important that you ensure that the seat fits your car, and that you and your partner know how to take it in and out of the car before you bring your baby home. This play with baby and travel equipment list will help you to prepare for your baby and ensure you have everything you need for the next stage. The essential list of equipment for playing with your baby and taking her on an outing.